Level 25: Relive the scarlet flower (1), Start clearing the road, Upgrade the town hall, Collect enough wood and repair the bridge (2), Build the workshop (A), Build the goldmine (B), Upgrade the town hall, Clear the way to the sawmill (D), Repair the bridge (3), Upgrade the sawmill (D), Relive the scarlet flower (4), Clear the way to the quarry (E), Build the goldmine (F), Upgrade the quarry (E), Collect enough stones and fix the bridge (5), Relive the scarlet flower (6), Upgrade the fisherman's hut (H), Upgrade the goldmine (F), Upgrade the tree of life (G), Upgrade the goldmine (B), Upgrade the goldmine (F), Upgrade the goldmine (C), Remove the giant thorn (7). Level 26: Build the farm (A), Collect the wood and upgrade the town hall, Repair the bridge (1), Upgrade the sawmill (B), Upgrade the farm (A), Repair the bridge (2), Build the quarry (C), Build the bakery (D), Repair the bridge (3), Upgrade the quarry (C), Upgrade the town hall, Build the storehouse (E), Repair the bridge (4), Repair the bridge (5), Start collecting gold from the treasury, Cut the purple stone (6), Build the bard tent (F), Cut the purple stone (7), Upgrade the sawmill (B), Upgrade the quarry (C), Repair the bridge (8), Repair the bridge (9), Repair the bridge (10), Build the tree of life (G), Relive the scarlet flower (11), Repair the bridge (12), Repair the bridge (13), Relive the scarlet flower (14), Upgrade the tree of life (G), Upgrade the farm (A), Collect all the gold from the treasury, Remove the giant thorn (15). Level 27: Collect available resources and upgrade the town hall, Build the hunter's hut (A), Clear out the rest of the road and collect resources, Upgrade the town hall, Use the markets (J), (K), (L) to get the missing resources, Upgrade the barracks (B), Repair the bridge (1), Clear the way to the hunter's hut (D) and build it, Get to the hunter's hut (E), Clear the way to the bard, Upgrade the hunter's hut (C), Upgrade the hunter's hut (A), Upgrade the tree of life (F), Clear the way to stonehenge (G) and start using it to extract crystals, Repair the bridge (2), Activate the runestone (3), Upgrade the hunter's hut (E), Upgrade the hunter's hut (C), Upgrade the hunter's hut (D), Activate the runestone (4), Upgrade the hunter's hut (A), Activate the runestone (5), Upgrade the hunter's hut (D), Upgrade the hunter's hut (E), Activate the runestone (6). Level 28: Collect available resources and upgrade the town hall, Clear the way to the barracks (E), Free houses (A) and (B), Build the sawmill (B), Build the storehouse (C), Upgrade the quarry (A), Upgrade the sawmill (B), Collect the resources and free the goldmine (D), Build the goldmine (D), Start repairing the bridge (1), Upgrade the town hall, Finish repairing the bridge (1), Upgrade the quarry (A), Upgrade the goldmine (D), Cut the purple crystal (2), Use the market (F) to get more food, Start repairing the bridge (4), Upgrade the sawmill (B), Build the tree of life (G), Remove the crab nest (3), Finish fixing the bridge (4), Remove the crab nest (5), Start clearing the road to the rune book (7), Remove the crab nest (6), Upgrade the goldmine (D), Upgrade the tree of life (G), Get the rune book (7). Level 29: Gather the available resources and clear the way to the bakery (A), Use the bakery (A) to get enough food, Clear the roads to get to the market (B), Use the market (B) to get wood, Build the tower (1), Upgrade the quarry (D), Repair the bridge (2), Upgrade the town hall, Repair the bridge (3), Upgrade the goldmine (E), Build the storehouse (C), Repair the bridge (4), Build the tower (5), Upgrade the goldmine (E), Upgrade the goldmine (F), Deal with the pirate (6), Build the tower (7), Gather the right amount of resources and upgrade the town hall to the fourth level. Level 30: Collect open resources, Collect the rabbits dropping out of the hunter's hut (G), Build the fisherman's hut (A), Build the quarry (B), Remove the obstruction (1), Get to the worker (2), Collect rabbits from (G) and (H), Upgrade the fisherman's hut (A), Clear the way to the hut (C) and build it, Take the purple key to open the portal (3), Build the workshop (D), Upgrade the sawmill (E), Upgrade the quarry (B), Shoot the evil eye (4), Open the chest (5), Build the crystal mine (F), Upgrade the hunter's hut (G), Shoot the evil eye (6), Upgrade the quarry (B), Begin to clear bombs for excess gold, Upgrade the hunter's hut (H), Upgrade the fisherman's hut (A), Upgrade the sawmill (E), Upgrade the hunter's hut (G), Upgrade the sawmill (E) to the maximum level , Upgrade the hunter's hut (J), Upgrade the barracks (K), Deactivate remaining bombs. Level 31: Gather available resources, Build the farm (A), Upgrade the town hall, Clear the way to the quarry (C), Upgrade the farm (A), Upgrade the quarry (C), Open the chest (1), Upgrade the quarry (C) to the third level, Upgrade the town hall to the third level, Repair the bridge (2), Clear the way to the market (D) and use it to harvest wood, Start mining gold from the gold veins (3), Get more food from the bakery (E), Gather enough resources and repair the bridge (4), Upgrade the farm (A), Build the crystal mine (F) and collect the available crystals, Repair the bridge (5), Build the tower (6), Collect resources and build the tower (7) and (8). Level 32: Gather free resources and upgrade the town hall, Clear the way to the sawmill (A) and build it, Build the bard tent (B), Build the storehouse (C), Clear the way to the market (D), Upgrade the sawmill (A), Clear the way to the windmill (E) and build it, Build the tree of life (F), Clear the way to the crystal mine (G), Upgrade the town hall, Remove the boulder (1), Get to the goldmine (H) and build it, Build the alchemist's lab (J), Gather the necessary resources to build an alchemist's laboratory (K) and build it, Upgrade the goldmine (H), Start clearing the road to the rune book (3), Upgrade the crystal mine (G), Clear the way to the rune book (3) and take it. 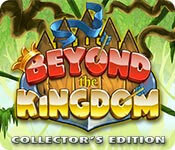 Sign-up to get informed when the Beyond the Kingdom Part series has new game released with BD Studio Games' FREE bi-weekly newsletter.